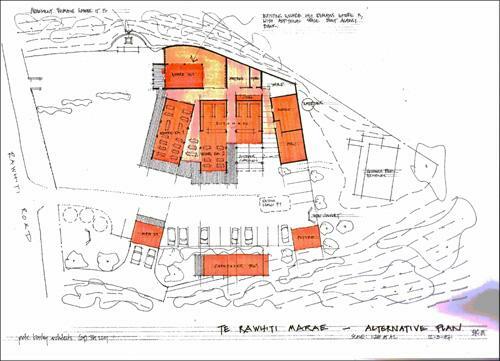 In early 2007, Pete Bossley, a famous, highly innovative, and environmentally aware architect, agreed to develop a concept for the Te Rawhiti Marae. Google his name and see his work. With huge generosity, he not only worked developing the concept for nothing, he offered his services free. Te Rawhiti Marae and the community are indebted to him for this. That the Shadwick Design was the result of consultation and funding restrictions. The Sponsor was keen to attempt to offer an alternative that was not expensive. He was also keen to have a building complex which in itself was a draw card for the tangata whenua, the residents and the whole community. Pete was invited to the Marae and was welcomed. He spent a few hours. Maria flew back to Auckland with Pete and Nancy. Our marae development project is featured on Pete Bossley’s website, Bossley Architects, under the institutions section.